Coldwater Machine will feature its SpotMeld robotic-joining system, equipped with new automated tool-change capability, at FABTECH 2016. Capable of volumes required for high-production environments, the SpotMeld solution enables the joining of aluminum (1000 to 7000 series), magnesium and dissimilar sheet materials. 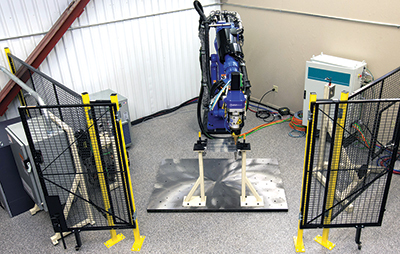 Mount the SpotMeld system on any industrial robot or retrofit for replacement of existing processes such as resistance spot welding, laser welding and riveting. The SpotMeld process is based on refill friction-stir spot-welding technology. It uses rotational friction to heat the workpiece materials, along with pressure to forge together the parts using wear-resistant tooling. In addition to joining lightweight materials, benefits include high-quality solid-state joints that are near original material strength; a small heat-affected zone; consistency in weld duplication; and fast weld times. And, the process is environmentally clean and safe, and uses no filler material or shield gas. A key advantage of the process: The tool doesn’t fully penetrate through the bottom sheet, leaving a smooth surface with potential for use on exterior body panels.